Al Capone was never prosecuted for his major league crimes – to get him jail the Feds did him for tax evasion. Much the same thinking is behind the pursuit of Pachauri's outpost of empire, TERI-Europe. Located in London, this is the one part of his empire which comes under UK jurisdiction, where the Charities and Companies Acts apply, in a situation where there is a very strong smell of malpractice – to put it mildly. A more pointed assessment might veer towards the supposition that this is a "front" organisation, its primary purpose being to launder a substantial flow of funds to other recipients, with minimum scrutiny and accountability. That the accounts of the charity (pictured left - click to enlarge) don't stack up is already evident from our previous piece, but we need a great deal more before we have a strong enough case to put to the Charity Commission by way of a formal complaint – which is the eventual intention. 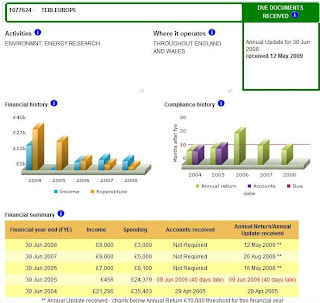 What I am doing, therefore – slowly and laboriously – is going through the tedious process of building a picture of TERI-Europe's activities and scale of operations, seeking to demonstrate that they far exceed anything that could possibly be covered by the income and expenditures declared to the Charity Commissioner. If this can be made to stick, Pachauri, his fellow trustees and his co-director – Ritu Kumar – could be in very serious trouble. What could help us on our way is a lead which came via our forum, identifying a payment from the Department of the Environment, Food and Rural Affairs (DEFRA) intended for TERI-Europe, but which does not seem to have found its way into its accounts. Even without that, there are several odd things about this payment. To the value of £30,417, it is intended "to provide funding to TERI Europe to cover salary and travel cost of the head of unit responsible to produce a Synthesis Report of the IPCC AR4." Working backwards, the main person responsible for this task, to which this funding applies, can only be Dr R K Pachauri. Yet the proposition that he should be paid salary and travel costs by DEFRA, when as head of the IPCC his costs are already covered and his salary is paid by this agency, seems bizarre. Even stranger is the proposition that the money is being allocated not to the IPCC but to TERI Europe, which has no locus and no responsibilities for the Synthesis Report. It is Dr Pachauri, chairman of the IPCC, not Dr Pachauri, director general of TERI and trustee/director of TERI-Europe who is doing the work. Yet another strange thing is that, although the money is allocated to TERI-Europe, DEFRA pays it to Cambridge University. One assumes the university is dealing with this as a project "managed on behalf of Defra by the Contractor/Funded Organisation selected." But DEFRA has not been slow to throw money at TERI-Europe in the past, so why it could not send the cheque direct this time is not explained. Howsoever, these are but details compared with the main event. What we have here is hard evidence of a payment of £30,417 – less the university's cut – allocated to TERI-Europe. The detail is quite explicit there: "to provide funding to TERI Europe ... ". What we also have is the payment period, which is "from 2006 to 2007". The sum will thus fall either within the 2005-6 accounting period, 2006-7 or even, possibly, 2007-8. Even if the sum was split between all three accounting periods, though, there are problems. Respectively, £7,000, £9,000 and £8,000 are declared as income – totalling £24,000. This is less than the sum paid by DEFRA. Even if DEFRA had been the only source of income in the period (and we know it was not - there was that "generous support" of the Global Opportunities Fund of the UK Foreign and Commonwealth Office) it cannot be the case that the sum has been declared. One can only speculate where the money did go, but that is not the issue here. On the face of it, TERI-Europe seems to be in clear breach of the statutory accounting rules applying to charities. And that is a criminal offence. What sort of audit trail there is back from DEFRA might also be relevant. If there has been an improper payment, it should know about it. But there is something very strange about the British government when it comes to Pachauri's outfits. It seems to have a strange urge to throw taxpayers' money at them. Thus we learn that, earlier this year minister for International development Douglas Alexander launched a partnership with TERI-India, pledging up to £10 million to support the work of TERI over the next five years. Amongst other thing, the money would enable TERI "to focus on building its own institutional capacity, helping it to become an even stronger organisation than it is already." Dr R K Pachauri was very pleased. And after he had offered his ritual comments about the "removal of poverty", he no doubt retired to his multi-million dollar home at 160 Golf Links – further then to consider the plight of the poor. If he were asked what had happened to the £30,417 paid to him, he probably would not remember. Pocket-change sums like that are so easy to forget. We trust, though, that the Charity Commissioner will be less than impressed.